Eyelash extensions have dominated the beauty industry for quite some time and because of different styles and techniques for lashing, lash techs can get quite overwhelmed with varied choices and will be confused as who to chose as the best eyelash extensions supplier. A great eyelash extensions suppliers take care of their new and existing customers.One way of showing that is by offering great quality products for good prices.Now of course you will need to try the quality first to determine if it’s any good, but it’s super important that your supplier offers the same quality over and over again and not just the once. Start by ordering products that are cheaper and fewer of them. Once you see the quality is good all throughout your small orders, start ordering more. Discounts on larger orders are a must. Selection is key. It is essential that you have a variety of options in terms of the designs, quality, texture or style of eyelashes. Once you showcase and let your clients know that you are equipped with classic and modern supplies, your branding and client base will also grow because they know you are capable of handling different types of eyelash extensions. Basically, this is the easiest way to determine if your supplier is reputable or not. 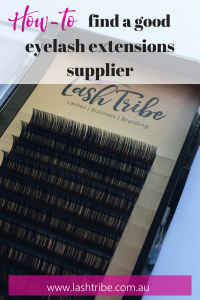 Always check the feedbacks or reviews from past buyers – whether their transaction with this certain eyelash extensions supplier is smooth or not. Especially if you opt for the online route, definitely check with the reviews on the Internet and research. Do extensive research. 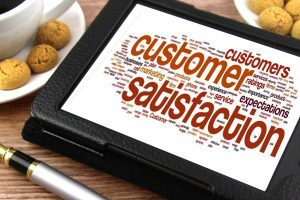 Look for red flags such as customer satisfaction and honest description of quality of product. You should also note how the supplier handled past returns or exchanges. These are vital elements when doing your research. Basically, what I’ve noticed is that trustworthy suppliers take good care of their customers. And it can be clearly seen on how they tackle everyday business transactions and offer effective deals or discounts. Take note of these tips when finding your eyelash extensions supplier. On another note, whilst we are talking about customers: I have this cool blog post that will show you how to deal with different types of customers. Especially the difficult ones. You can check it out here. So, I hope these few tips will make your search a little easier. Would love some tips on how to apply lash extensions.